Prime Minister May insists that there will be no extension for the Brexit transition. The signs point otherwise, which puts GBP and its currency pairs in a peculiar situation. The Brexit will be remembered as one of the greatest blunders of our decade. It’s the rare case when it’s hard to pinpoint what exactly went right — and even then it’s mostly by accident. Two years after the referendum, no one can still make sense of how exactly will the United Kingdom leave the European Union. And markets hate uncertainty. Investors want to believe in GBP — as you can clearly see by several attempts at the bullrush. However, every effort to recover the value is immediately intercepted by political instability. It’s not something particularly new for Forex — but the sheer scale of the issue is rather phenomenal. The daily trading is affected the most. Take a look at the chart from 2018-11-19. The downfall around 8am represents the statement by May regarding the Brexit transition time. One would think that such a market would attract the bears — and, to an extent, it does. 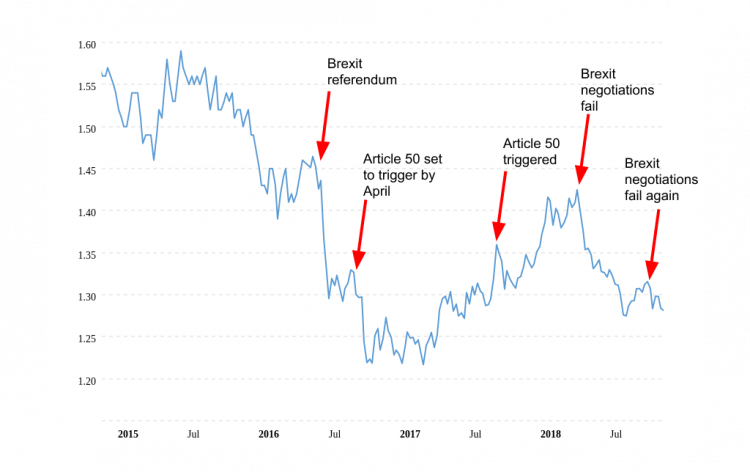 However, Brexit news can be positive too, and those are immediately followed by an attempt to bullrush the market. Which successfully closes by a StopLoss all bearish orders before fizzling out and returning the status-quo. While the market is definitely bearish, even the bears tend to tread carefully. Theresa May insists that the Brexit agreement will be signed by the end of November, despite Dominic Raab’s resignation and all the other issues. This would stimulate the British economy and finally allow the currency to reemerge after a long dive. However, this is possible only if May manages to reel her own cabinet in and push the agreement through. Which is precisely where the problem lies. 23 Tory MPs have publically sent Letters of No Confidence to the 1922 Committee. The threshold is 47 — however, inside sources tell that some other MPs sent their letters in private. In fact, sir Graham Brady — the head of the 1922 — might already have 40 of them with more set to arrive this week. If the Motion of No Confidence passes, May will be forced to resign, leaving the Brexit situation in the air until her successor is appointed. Realistically, this would put the sign-off way into 2019. And despite the statements by the PM herself, this less optimistic option becomes more and more real each day. Right now, the GBP currency pairs form a dangerous market. Part-time traders (such as https://www.manilatimes.net/part-time-trading-on-forex-platforms/450422/) and newcomers to the market should look for safer havens. For example, USD/JPY is a lot easier to read at the moment, especially with https://justforex.com/trading-platforms. However, confident traders might want to take a swing at the bearish GBP market. In that case, some brokers offer rather tight spreads that will help to soothe the risks. Alternatively, now might be a good time to take a break and prepare for the next year. The Brexit Conundrum is unlikely to resolve until then.